Knitting projects and Blogs, Blogs, Blogs! Yes, I know I've been remiss in not posting for so long! I still am not able to get my photos into my computer and that really puts a damper on blogging. I've been making goat milk soap again. I got some new molds and some fragrance oils last week from Soap Crafters Co. I usually only use essential oils, but the blends of the fragrance oils sounded very tempting, so I'm giving them a try. The photo above is from last fall's round of soapmaking. We still have plenty of soap left, but I love experimenting with the different scents! I've also gotten back to knitting on third pi shawl. 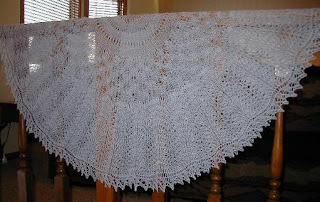 Here's a photo of the second pi shawl I made in January, 2006. It's knitted of purchased laceweight alpaca yarn - very soft! Knitting a pi shawl is a long, relaxing project which is why I keep making them even though I never wear them. I'm almost done with my current one. 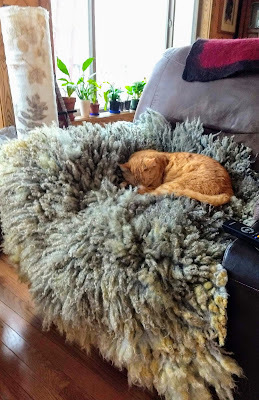 I'm using Elizabthe Zimmermann's directions for the lace pi in Knitters Almanac and it's being knit using handspun, handcombed wool from the lamb fleece of our three-year-old wether, Willy. I was combing, spinning and knitting as I went along and I've just come to the horrible realization that I shipped out the remainder of that fleece to be processed into combed top! I can't believe I did that. So now I have to comb some of Willy's roving from last year and hope there isn't too much difference in the yarns. Just goes to show, you shouldn't take a long hiatus from a project like this. I set it aside back in March just before lambing began. I've been reading the various blogs of fellow shetland breeders and it's so much fun to see the diffence in styles. Shepherd Chick is very entertaining with her lighthearted entries and a full cast of characters and lots of photos. Sabrina Erickson's new blog, Boston Lake Farm, is always an interesting read, she's a great writer. And Mary Ellen's probing questions on her Meadowwoods blog give a breeder food for thought. Not that I need that, I'm constantly analyzing my flock situation and thinking ahead about my flock plans. Speaking of which, I'm down to 28 sheep now! Rayna from Barnum came down last week and picked up Bramble Gillian, her daugher Diana, great granddaughter, River Oaks Tasha, grandson, River Oaks Isaac, and Bramble Lottie, an F1 Minder. And a week before that, Gillian's twin ewe lambs and two other ewe lambs left to live down near Rosemount, MN. Hopefully all are doing well in their new homes. I really miss Diana, she had a way about her. Now I only have a few ewe lambs, two ram lambs and a wether left for sale. I may show some of them at Jefferson as I am thrilled with the conformation and fleece they got from their sire, Windswept Boggart. Only wish I could put in some recent photos. Our pasture is quite sparse and I've been feeding hay. We need more rain. It's going to be hot and humid again this week...hope everyone stays cool. I'm finally feeling somewhat better after days of running a fever, two doctor calls and a trip to the emergency room for IV antibiotics the other night. In addition to my fever was a very tender and swollen lymph gland and a 3x5" rash around a bug bite. I don't recall having a tick there, I was thinking it was monster mosquito bite that itched like crazy (there were two big bites, but just one had the rash). Now I'm thinking they may have been spider bites, but I'm not sure. We fenced off two acres of deer territory in May and I had a couple ticks attached then. Anyway, I was feeling just awful on Monday morning with a temp of 101. Had to cancel the vet visit so I could see the doctor. He started me on an antibiotic to treat cellulitis and/or Lyme Disease. But the rash got bigger and I was shivering and shaking like people with mylaria in the movies by supper time. My skin just hurt all over. I took my temp around 10 p.m. and it was 103.8 degrees. By the time we got to the emergency room my temp was over 104! They did some bloodwork and started IV fluids, analgesics, and the antibiotic. The analgesic helped me feel better, but I was so HOT while antibiotic was going in (which took over an hour). We left the ER around 1:30 a.m. and my temp was down to 98.6 -- amazing! I'm taking lots of pills right now and the temp is staying at 98 or even less. The rash hasn't gotten bigger and looks to be fading a little this morning. I'm still feeling weak and fatiqued, but hopefully that will improve as the days go by. As for farm news, we got our big bales delivered and stacked in the barn. We'll probably have to buy some more later this year, unless we keep getting lots of rain and maybe a second crop this year. The weaning didn't go well at all. After a night of constant crying, I found only three lambs who hadn't gotten back with their moms. Apparently one of the horizontal wires broke off one of the panels we used...Oh well, I'll do like I always do and just remove the ram lambs. 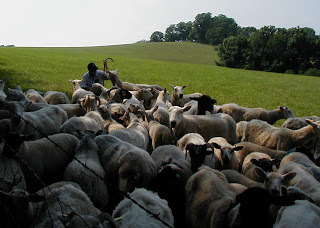 The ewes can wean the ewe lambs themselves. So happy to have the vet come out yesterday and look over the flock. It's so nice to have someone closeby who will do farm visits. If you've gotten this far, you deserve a photo. My camera isn't functional nowdays, so I'll post this one I took at Littledale farm in Wisconsin. It's Graham Phillipson with his flock of North Country Cheviot and Scottish Blackface ewes and mules with their lambs.